TEA CANISTER - Want to keep those tea leaves fresh to the last cup? Our plastic canister with clip lock and spoon design looks great in any kitchen. Seals out both light and air, enemies of your tea leaves. The spoon measures 1 tablespoon and hangs on the side of the canister, handy for the next use. Holds up to 33.78 fluid ounces of loose tea, depending on the type. "NEW" Glass Tea Pot - This Teapot is a 3 pc. set including lid and infuser. The see through design makes it nice to watch as your tea brews. Glass Tea Cup TEA FOR ONE - Glass tea cup + saucer & stainless strainer 4 pc. set. Very modern style with see through design to watch your tea brew in the cup. Lid used on top of infuser for brewing and as a holder for infuser. Get 1 oz. of our loose tea Free with the purchase of any Tea Cup with infuser set. Herb Tea Cup With Infuser Sets - These Tea Cups are made of porcelain and are available in Fruit Tea design and Lemon Tea design. Patterns are bright and cheery. Functional 3 pc. sets include cup, lid, and stainless infuser. They look great on display in a collection. Made in Germany. 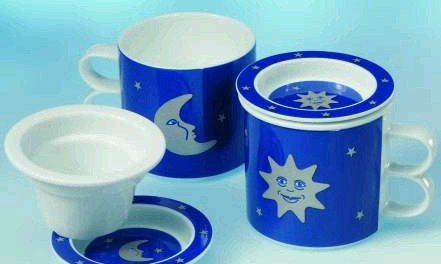 Sun or Moon Tea Cup with Infuser Sets - These Tea Cups are made of porcelain and are available in a Sun design and a Moon design both with scattered little stars. Pattern colors of blue, silver and white. Functional 3 pc. sets include cup, lid, and porcelain infuser. Lid also functions as a plate for infuser. They look great on display in a collection. Made in Germany. We accept Checks, Money Orders and Credit Cards! Link Partners Shipping Info Contact Us CLICK HERE FOR OTHER GIFT IDEAS!